The combination of soft pandan cake, chocolate filling and whipped cream give a very surprising taste. 2 cups pandan leaves (cut-up) plus 3/4 cup water; blend until it is very fine; then strain to get a clear juice. Preheat oven to 180 degrees C (350 F). Line three 9-inch (23 cm) sandwich tins (round cake pans) with baking paper. In a large bowl mix together egg yolks, flour, baking powder, oil, pandan juice and sugar. Mix with a hand whisk until smooth. In a clean large bowl beat egg whites, salt and cream of tartar until stiff; gradually add in sugar and continue to beat until very stiff peaks form. Pour mixture into the prepared tins and bake in preheated oven at 180 degrees C (350 F) for 25 to 30 minutes. Let cakes cool in pans for 10 minutes, then invert onto cooling racks to cool completely. Mix all of the filling ingredients together (except for the butter) in a saucepan and cook over low heat until filling is thick and of spreading consistency. Remove saucepan from heat; add in butter and stir well. Place one cake layer on cake plate, spread filling evenly over top, then top with second cake layer, spread filling over top; top with third cake layer. 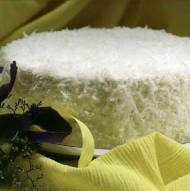 Frost the top and sides of cake with whipped cream and decorate top and sides of cake with freshly grated coconut or chocolate shavings (or both). Makes one (3-layer) cake, 8 to 10 servings. Dear Diana, most interesting. I have not tried this yet! Pandan leaves make a pleasant hot beverage, then use the leaves in pot pouri bowl. This looks like it's going to be great! My boyfriend made this for my birthday and it is indeed excellent. The pandan leaf juice gives the cake a slight pistachio-green tint and a subtle delicious flavor. Unsweetened whipped cream and coconut are ideal, making a fabulous rich not-too-sweet dessert. I would add that you should gently fold the rest of the batter ingredients into the eggwhites to get the fluffiest cake texture. It's a keeper--we'll make this again. Thank you Anita for sharing this recipe! This is the first time I succeeded in making a chiffon cake after 4 failures.. I made a few changes to your recipe and it turned out to be a delicious Chococonut Pandan Chiffon cake! =) Used 1 large tube pan instead of 3 cake pans, and made the chocolate filling into a frosting while replacing the evaporated milk with coconut cream. YUMMY! Hi, Can I substitute Pandan juice for Pandan paste?